Sorry, you can only order up to 28 units of this product! This Outsunny growhouse is a great addition to any gardener. 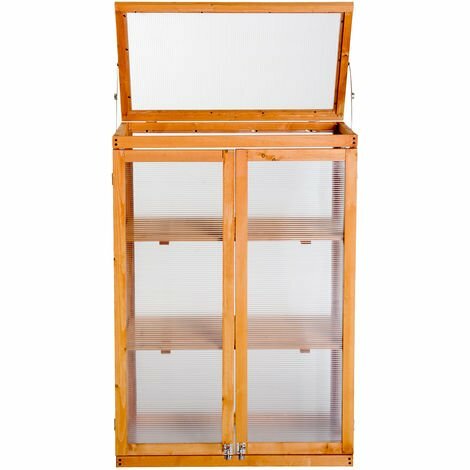 It is made from fir wood and poly-carbonate panels, with 2 shelves to place plants. It is ideal to keep the temperatures cool for the summer and warm in the winter. This will also protect the plants against harmful UV rays which will promote better growth and will be a great item to have for nursing young buds. The house comes complete with 2 shelves, top access opening and double doors for forward opening. The grow house does not have a bottom to enable the user to directly place over growing plants if required.